Garden City, New York – Adelphi University has been recognized in a 2019 national ranking by College Factual. Adelphi has achieved high marks in these rankings for best education quality. 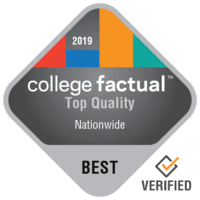 College Factual’s “Best Colleges Ranking” highlights colleges and universities that meet high standards and provide quality outcomes to students. Some of the factors that make up the ranking include student to faculty ratio, graduation rates, student loan default rates, and other quality metrics. Read the full rankings methodology. Ranked #259 out of a total 1,779 schools, Adelphi University performed quite well in these rankings. In addition, Adelphi was ranked #31 out of 133 in the state of New York, making it a ranked school in New York for overall quality. The university improved its position 2 slots over the previous year’s ranking of #33. See the full Best Colleges Ranking. See the full Best Colleges in New York Ranking. Adelphi ranks as a top school according to @CollegeFactual. Adelphi University is located in Garden City, New York in what is generally considered a suburban setting serving approximately 5,200 undergraduate students. The school has an approximate 11 to 1 student to faculty ratio and an on-time graduation rate of 57%. College Factual, located in Troy, New York, is a leading source of college data analytics and insights, with a strong focus on student outcomes. College Factual provides in-depth coverage for over 2,500 colleges and universities and over 350 college majors, helping students discover which of those colleges and majors are best for them. These insights are available to students from 160 countries interested in pursuing accredited college degree programs in the United States. Learn more about College Factual. Get notified when similar news about Adelphi University happens.